Alrighty folks, today I'm teaming up with Alycia from Crowley Party to answer random, nonsensical questions about ourselves. I mean, isn't that the purpose of blogging? I have a ton of respect for Alycia- she always has so much on her plate and still manages to produce a high quality blog. After reading this post make sure to check out her blog- you're going to want it on your daily reads. Oh- and don't forget to enter for a chance for free ad space in November on both of our blogs. Together we average 150,000 monthly pageviews so winning this giveaway would definitely give a great boost to your blog. What is the weirdest thing that has ever happened to you? ALYCIA: Oh man this one is a toughie. I have had a lot of strange situations but I think the worst was the one situation my own husband put me in! Trevor loves making people uncomfortable, and trust me, I am not spared! Trevor used to work for the senator before law school, and one night I went with him to help out at an event. The senator came in and said hi to Trevor, in which he turned around to introduce me. The senator looked at me and shook my hand, turning to Trevor and said, "How did you get such a beautiful girl to marry you?" I blushed of course, but didn't realize just how much more I would be blushing in a few seconds. My husband, without missing a beat, responded with, "What you don't know is that she used to be a man!" I wish someone could have snapped a picture of all of our faces in that moment. You could tell by the Senator's face that he didn't know if this was a joke or not. I tried telling the senator that I was indeed born a girl, and nothing has changed. The whole thing was so weird and awkward... thanks a lot husband. Of course Trevor thought the whole thing was hilarious. We both laugh about it now! You know, the type of romantic, sentimental stuff that you just love to hear at weddings. My family is very very very very conservative. Naturally, we were horrified. Now we're to the point where we just laugh at it, but whenever it gets brought up Greg and I just look at each other, laugh, and say "Yah... that was weird..."
What is your worst and best experience with blogging? BONNIE: The worst is definitely the criticism. The internet gives people a mask to hide behind and allows us to say things that are much more hurtful than we would ever say in real life. I have been called "annoying", "terribly immature", "ridiculous" and even compared to "bean paste" (say what?) by perfect strangers. In the long run though, it has been good for me as it helps me be aware of my weaknesses, and if nothing else gives me tough skin. The best experience with blogging has been to get into a habit of writing consistently. Writing for me is how I figure out the world around me so as I write I am able to learn more about myself, my relationships, and important events in my life. I feel like I become a better person through blogging and that it helps me to be more sensitive and aware of other people's needs. And of course- the friendships! It blows my mind how many amazing women there are in the blogging community. ALYCIA: There is good and bad that comes with blogging. But I would have to say that the good astronomically outweighs the bad. The worst experience I have had with blogging is seeing nasty things written about me online. However, I know it comes with the territory. If you put yourself out there so publicly, you are bound to get negative feedback along with the good. And I am okay with that, because I know who I am, and who my friends are, and there is so much good too. What do you like about the other person's blog? BONNIE: One of my favorite things about Alycia's blog is how stunning she always looks! She can pull of any look and she is so freaking photogenic, so half of the time I just go to look at how amazing she looks in her pictures. 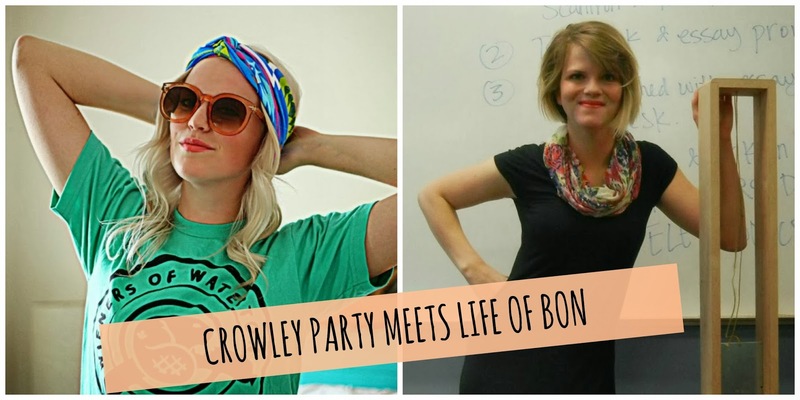 Besides looking gorgeous in pictures, she takes stunning pictures so whenever I want a little inspiration on how to spice up my posts with some great photos I make sure to visit Crowley Party! Hi! These questions and answers were great! I love this! It's fun to see to Utah bloggers team up, cause I'm living in good ole Provo myself! Your father in law sounds like a fun guy! Hi guys! I love you both and sure got a kick out of reading this. haha you guys are great. I loved reading more about you guys! Thank you for such a great giveaway! Hey Bon :-) Loved reading more about you, and I love the wedding toast story! love these kinds of posts and being introduced to a blogger I haven't read before!! love both of your blogs! I agree with Alycia that one of the best things about blogging is the memories--I've also come across posts that tell stories I would have forgotten if I didn't write them down! Ohhhh my....I really hope that type of speech doesn't happen at my wedding! I would die! super cool! crossing my fingers! I wish you gave another option to start entering the giveaway--I hate GFC but love Bloglovin! I think one of the hardest parts about blogging for me is the realization that since I can't always fully connect with all of my readers, I'll sometimes lose readers (or that maybe they were only in it to enter a contest or maybe I said something that offended them). I'm not really enough of a "big" blog to have gotten much criticism yet, but it's hard knowing that I can try my best to put engaging content out there, and sometimes people will still choose to stop following/reading. It seems like such a silly thing now that I type it out, but it's been a hard pill for me to swallow. It's enough to make you question your own ability to engage other people. I always love a good Q&A! Thanks Bon & Alycia! !